We're a month into our last year of homeschooling. Or more like: I'm a month into it, but Duncan is closer to two months in. Duncan started his senior year in mid-July with a dual enrollment class at our local liberal arts college, Maryville College. The Great Smokies Experience is a phenomenal 12-day program open to high school juniors and seniors nationwide. They spent the majority of the class living at Tremont Institute in the park, with the first few days on campus at Maryville College and at a few other local spots. Activities included hikes, a canoe trip, scientific species surveys, exploring the park at night, an interpreted climb up Mt. LeConte, as well as daily readings and time in a classroom discussing environmental issues. Duncan absolutely loved every bit of it. He said that although he's grown up in the Smokies, he had an entirely new perspective on his big backyard as a result of this class. It was truly an amazing experience! He earned a science credit for high school as well as credit for a three-hour Introduction to Environmental Issues and Sustainability Studies. Besides his writing class, he is finishing up odds and ends on several different Boy Scout merit badges. He already has his Eagle Scout award, but he had a bunch of badges that he started last year that he didn't quite finish. 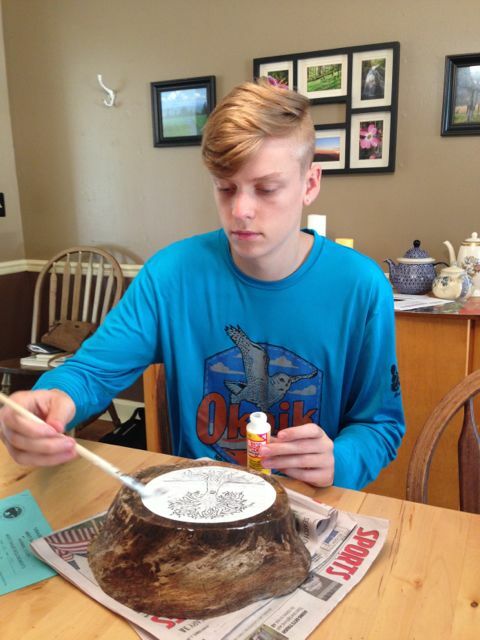 Here Duncan is finishing his Art merit badge—finally! He's been working on this one for a year. He'll be wrapping up health this semester, and we have plans in the works for a Tennessee field trip class with a few of his friends. First stop: Brushy Mountain State Penitentiary. Because boys. And, of course, we'll be doing a couple of final college visits, and then he'll begin the application process. I took beginning-of-the-year pictures while Laurel was still here, so I could get senior year pics of both of them. 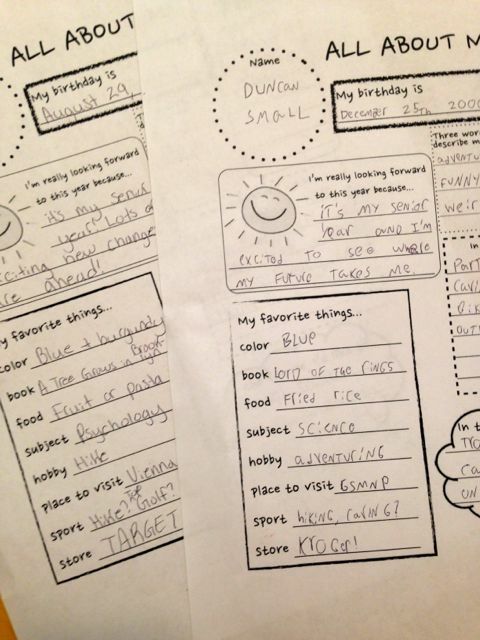 I also begged them to do one last "All About Me" page, and they sweetly obliged. They are adorable. We've been doing these at the start of each school year in various forms, and I so treasure these memories. I keep them in our Big Box of Books. One last year: I'm savoring every moment, every chance to sit with Duncan at the dining room table, every movie we watch together, every field trip we carve out for ourselves. I may even get up the courage to look through our Big Box of Books one of these days. Big News in our SmallWorld!